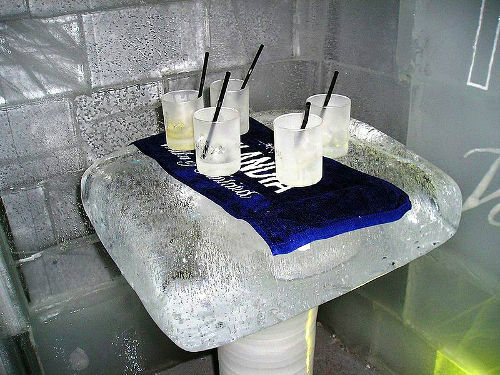 In ice bars, just about everything is made of ice – tables, chairs, walls, the bar and even the glasses. The establishments are typically kept at 23°F (- 5°C) to ensure nothing melts. The bars are hermetically sealed to keep the temperature where it needs to be. Guests are given thermal coats, boots, hats and gloves before entering. The recommended length to stay in an ice bar is about 40 minutes. Although they are usually located where it is naturally cold, ice bars have been gaining popularity all over the world, including warmer climates. There are now ice bars in places such as Las Vegas, Dubai and Mumbai. 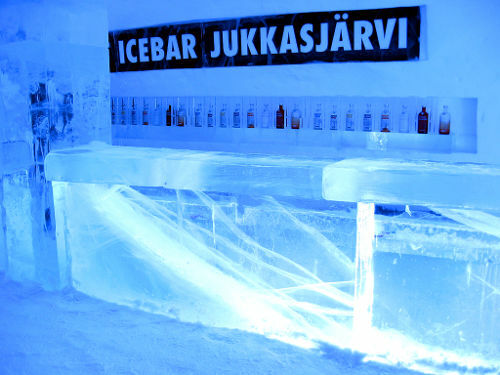 In colder climates, such as Sweden, some ice bars are seasonal. They are built with ice harvested locally in the beginning of winter and left to melt in spring. 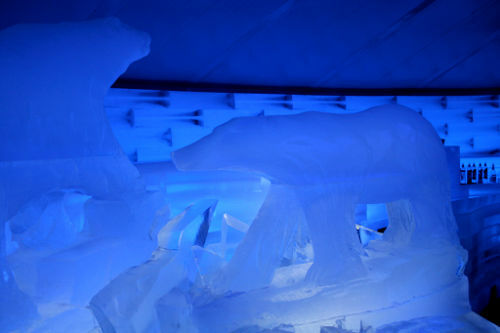 Here are some photos of ice bars around the world. 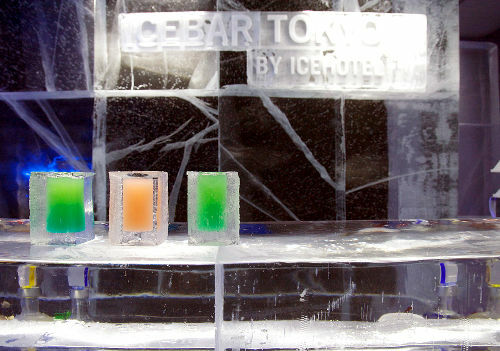 “Purity with a Twist” is the theme of ICEBAR Tokyo. The artists who designed the bar hope that guests will enjoy the purity of the bar itself in playful and relaxed spirits. Drinks at ICEBAR Tokyo are served 'in the rocks' in glasses made from ice. ICEBAR Tokyo was brought to Japan by Sweden's ICEHOTEL. 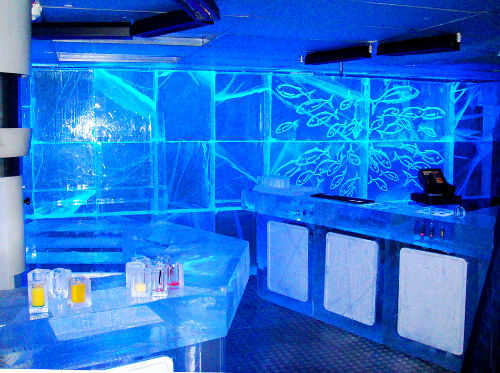 40 tons of arctic ice from Sweden was used to build the interior of ICEBAR Tokyo. ABSOLUT ICEBAR Stockholm's new theme "Aquatic" was unveiled in April 2010. It promises to have guests feeling like they are on the bottom of an ocean. ABSOLUT ICEBAR Stockholm was the world's first permanent ice bar. It opened in 2002 and is located in the Nordic Sea Hotel in downtown Stockholm. 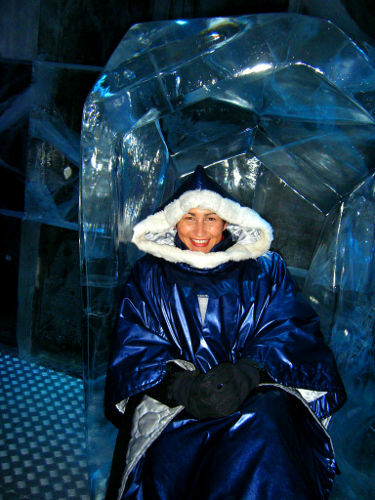 ABSOLUT ICEBAR Quebec is located inside the city's Hôtel de Glace, North America's only ice hotel. The hotel only exists seasonally - it is constructed every winter and stays open until spring's arrival begins to melt it. 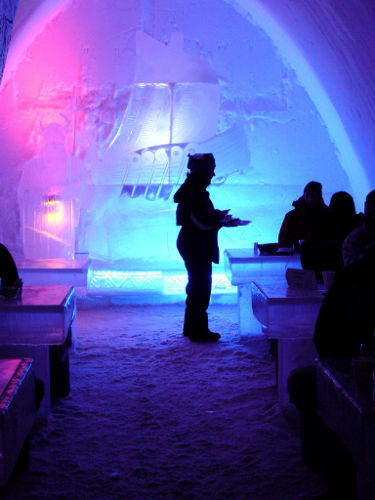 Not only does Finland's SnowCastle IceBar serve hot and cold drinks, guests can also enjoy appetizers at the bar. 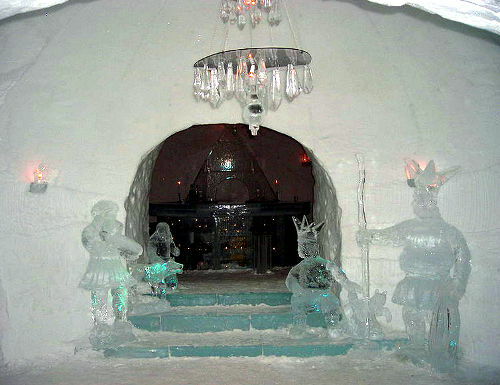 SnowCastle has a SnowRestaurant where diners eat their meals on tables made of solid ice. 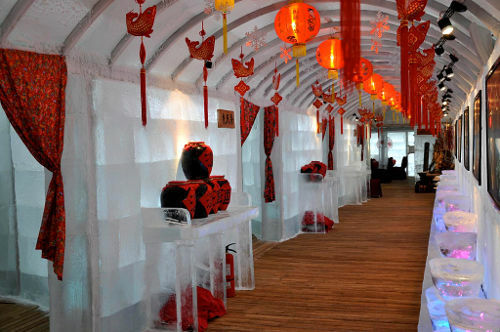 This ice bar in Harbin, China was built for the city's 2010 Ice and Snow Festival. Harbin is one of China's northernmost cities and sometimes called the "Ice City" because of its icy winters. Its Ice and Snow Festival is one of the biggest festivals of its kind in the world. Helsinki's Arctic Ice Bar is, strangely, housed in La Bodega, a Spanish restaurant. 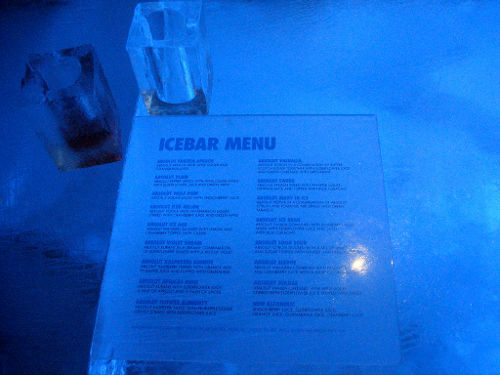 Like most ice bars, everything in Arctic Ice Bar is made from ice, including the bar, tables, chairs and glasses. 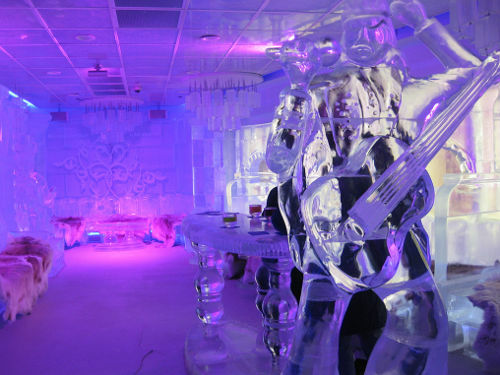 This Hong Kong ice bar serves over 60 different kinds of vodkas. It is located in Balalaika Restaurant, a Russian restaurant in Lan Kwai Fong. 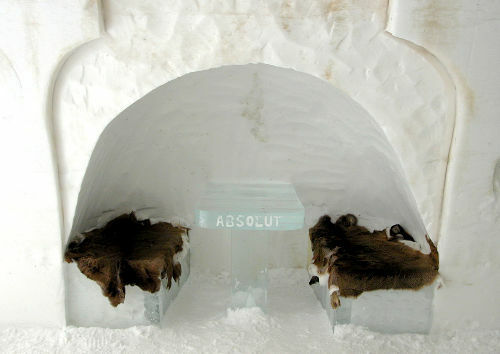 Absolut has quite a few ICEBARs around the world. Besides the locations we've listed already, they have bars in London, Copenhagen, Jukkasjarvi and Oslo. Las Vegas has an Eiffel Tower, a Statue of Liberty and an Egyptian pyramid so it just makes sense that this desert city should also have an ice bar. 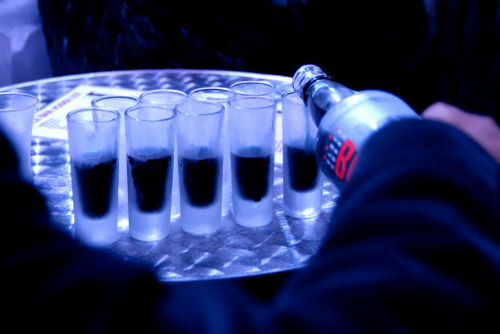 In addition to their Las Vegas location, Minus 5° Icebar has locations in Baltimore Maryland and Monte Carlo. What could be cooler than drinking in an ice bar? 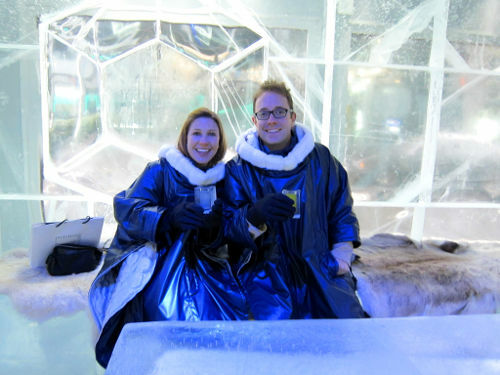 Drinking in an ice bar in an igloo! The Alta Igloo Hotel is the only one of its kind in the world. This just might be the coolest ice bar yet. Ice Space Ice Bar in Eliat Isreal offers guests all the usual comforts and novelties that most ice bars have PLUS an ice slide. Visitors can sled down an 18 meter (59 feet) slide inside the bar. Submitted by Colleen (not verified) on Fri, 06/18/2010 - 07:30. Submitted by Ice Luges (not verified) on Tue, 07/06/2010 - 21:04. Incredible ice bars. Specially i like a aquatic theme ice bar. I often visit the ice bar at weekend.